At the usual meeting in May of Travellers Lodge No 4679, Roy Osborne was to have celebrated his 50 years in Freemasonry. 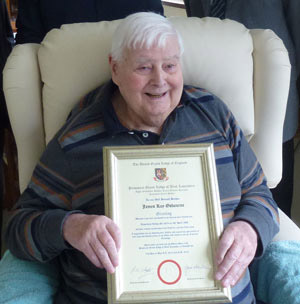 However, Roy was made an honorary member in 2016 due to a long term illness making it difficult for him to attend his beloved Travellers Lodge. The lodge’s proposed celebration in May was cancelled at Roy’s request, due to his health. The opportunity was taken by members of the lodge, along with the Warrington Group Chairman Andrew Barton, to liaise with Roy’s wife Diane and Thursday 12 April was the date for an informal home visit and presentation. John Atkinson, secretary and John McConnell, previous almoner, had done the ground work in the arrangements. John Atkinson, being the advance party, attended in the morning and spent a pleasant hour reminiscing over happy times in the lodge and left a small token of Roy’s favourite tipple. In the afternoon after a suitable respite and recovery, the rear guard arrived in the form of Andrew Barton, John McConnell, Barry Corcoran WM and Mike Hamilton. This was an encore to the morning’s meeting; during which Andrew Barton presented a certificate from the Provincial Grand Master Tony Harrison, acknowledging Roy’s long service in the Craft and extended the good wishes of Assistant Provincial Grand Master Kevin Poynton. A delightful hour was spent chatting and joking about Roy’s time in the army and National Service and happy times in his Masonic career. 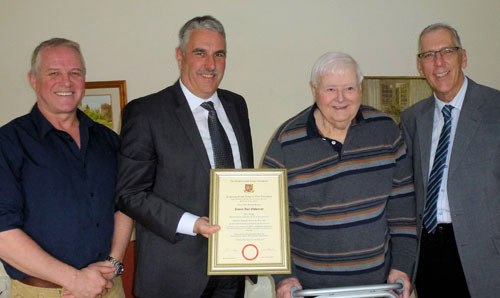 Roy’s interest in the origins of his surname was satisfied with a presentation from Barry of a framed Osborne Heraldic Crest and the history of its origins, on behalf of the lodge and its members. Pictured from left to right, are: Barry Corcoran, Andrew Barton, Roy Osborne and Mike Hamilton. Roy, in his latter position in the lodge was the musical director/organist. He was self-taught as a pianist having learnt to play by ear, which Roy said was painful. He also said he styled himself on that famous concert pianist Leslie Dawson and that all the notes were there but not necessary in the right order! The lodge recognised that his music had contributed to many atmospheric and enjoyable ceremonies during his time tinkering on the ivories. Roy was born on 2 November 1935. He attended Boteler School where he enjoyed many sports including rugby and football, during this time he played for Latchford Albion and the Lord Rodney Teams. His National Service was served in khaki in the ‘Signals Division’ in 1960 and he served in Germany. On the Austrian Tyrol he spent three months in a white snow suit pretending to be invisible on the mountains and became an alpine skier, first class. He was demobbed in 1961 without the suit (they stopped issuing them the year before). In civvy street he started with ‘Merseyside and North Wales Electricity Board’ (Manweb), trained as an electrical engineer and retired as distribution mains manager, based in Liverpool. Roy was initiated into Freemasonry in Travellers Lodge on 5 April 1968 at Warrington Masonic Hall. He was master in 1981, organist for over 20 years and made an honorary member in 2016. At Provincial Grand Lodge he was appointed to PPrAGDC in 2001 and promoted to PPrDGSuptWks in 2006.